"We were driving down NASA Road 1, and traffic was really moving slowly," says Eileen Hawley, a public-affairs officer at Johnson Space Center in Houston. "Then I realize, darn, we're stuck behind the Hubble Space Telescope." Even without a brush with cosmic greatness -- or a mockup of it -- it doesn't take long to realize that Johnson's neighborhood of Clear Lake is just a tad space-crazy. 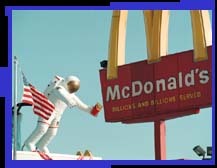 On the roof of the McDonald's stands a space man clutching a red carton of French fries. Down the street there's NASA Nails, and for those mane-mussing microgravity missions, a NASA Hair Center. "Houston, we have a Quarter Pounder." 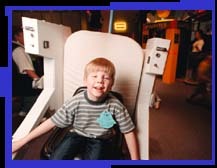 At Space Center Houston, a theme-park/museum next door to Johnson, a guy dressed as a furry, purple moon presses the flesh as kids explore a space toilet and take turns landing a virtual shuttle. I skillfully crash the shuttle and refuel with a vacuum-packed astronaut ice-cream sandwich. It's sensational: When the shards of arid, brown foam rain down in my lap, this ice cream actually tinkles. Though a bit more dignified, a similar air of celestial pep pervades the tightly controlled grounds of Johnson Space Center. There are, for starters, a lot of fast cars in the parking lots. Inside the buildings, posters and photographs of astronauts line the walls, and streamers and balloons hang for the seven-man crew of the Hubble Mission. The way Johnson people turn serious when they talk about the astronauts, and the pride they take in them, catches me by surprise. It's not the goofy adoration we normally reserve for celebrities; nor the slack-jawed reverence we give people who are distressingly smart. It's more personal. Perhaps the risky nature of the business, and the endless drills for launch disasters, orbit disasters and landing disasters keeps the possibility of death bright and current. "They are truly nice guys," people keep telling me. "Especially this crew. Really, really nice guys." adjacent to the Johnson Space Center. Still I expected they would have tough nicknames like Buster or Bullet or maybe Volt. But even their nicknames are nice. Almost cute, even. Commander Kenneth Bowersox is "Sox." He's built like a wrestler, but his face is calm, and in a busy room, his eyes cover everything. 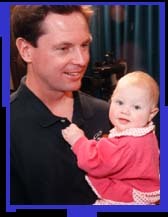 Steven Hawley, Eileen's husband, is "Doctor Stevie." In the simulator cockpit, he yuks about "the world's biggest rocking chair," but he's also reaching with an aluminum stick to knock off each switch about a second before Bowersox says over his shoulder, "Hawley, can you get the..."
Joseph Tanner, or "Joe T," is tall and straight, but his whole body loosens when he laughs. Scott "Doc" Horowitz, the pilot, has sad-shaped eyes and a near-permanent, gentle smile. Greg Harbaugh wears a straight face in public, but it's he who calls the shuttle simulator control room and asks trainer Gail Barnett to tell Bowersox, Hawley and Horowitz, who are suffering in their pinching flight suits and helmets, that the rest of the crew "feels their pain." And that they're having a grand old time at the gym, by the way. "If we ever get out of here, they'll feel our pain," Hawley promises, and the sputter of laughter fills the headsets. Bowersox proposes punishing Harbaugh, Tanner and the other two Mission Specialists, Steven Smith and Mark Lee, with extra simulations of their own, but admits they'd probably ignore his orders. Hawley nods in agreement. "It's amazing, the respect you get from this crew: 'Nah, Sox, I don't think so.' 'Nope, I'm not doing that.'" But the next afternoon, at the end of their preflight press conference, there's a spontaneous chain of elbows around shoulders as the astronauts unhook each other's microphones. It's almost a tear-jerker, these combed and shined and brainy men who are, although they're about to blast themselves far, far from home, still thinking of each other. In fact, I think I'm going to buy them each an ice-cream sandwich.